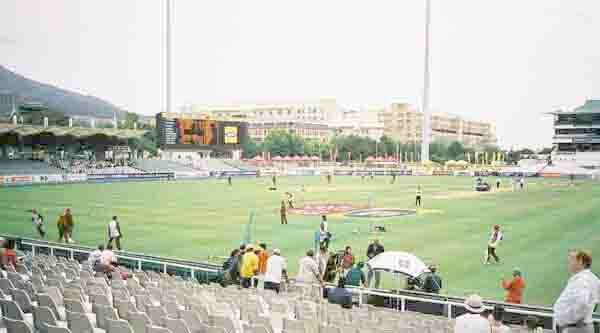 The photographs on this page were taken on Monday the 5th of January 2004 during the third cricket test match between South Africa and the West Indies. The picture above was taken before the start of play on the fourth day. The West Indies team are doing their warm ups and a bit of fielding practice. 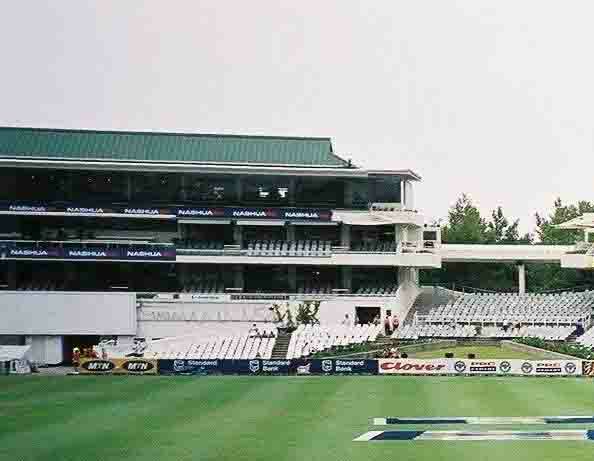 In the background is the main scoreboard at Newlands where the score is shown to the spectators and where replays of every ball and incident that happens on the field are shown. 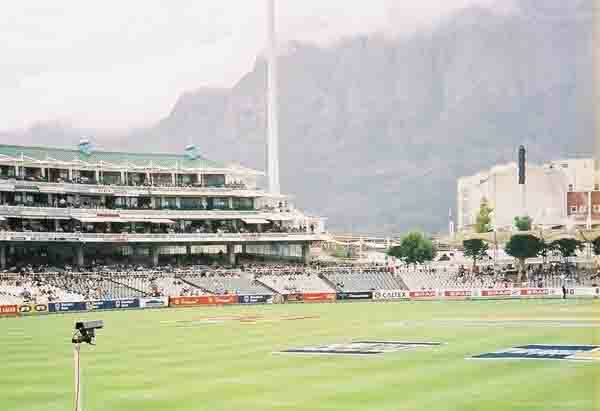 The large buildings in the background are the Newlands Rugby Stadium. In this photo the TV3 presenters Kass Naidoo and Colin Croft are doing their start of day introductions. 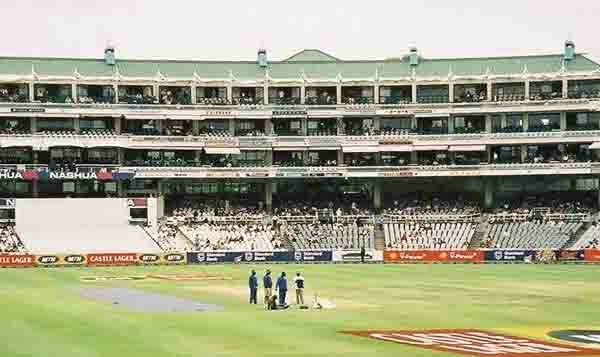 All test matches in South Africa are televised. The stand in this photograph is at the north eastern side of the ground and is built where Castle corner used to be. To the right of the stadium you can just see the Oaks enclosure. This is the new Oaks enclosure. In the old days it had wooden benches and many oak trees. When the new stadium was built many of the trees were cut down to make place for the new buildings. The Oaks is a lovely place to watch the cricket from, except in the afternoons, when you get the sun directly into your face. This is the new members stand which was built where the old stand used to be. 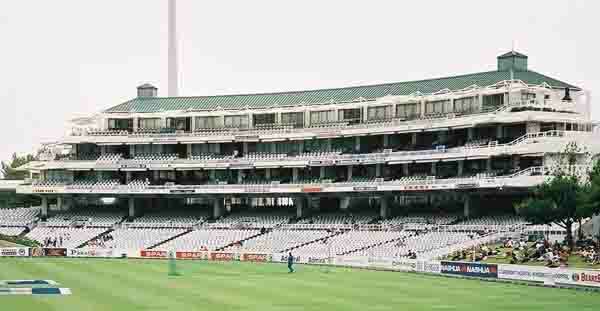 The balconies to the left and right of this stand are where the players dressing rooms are. The one on the left for the South African team and on the right for the visitors. The President's Stand is built at the south end of the ground. In the old days this was the main grandstand. Today it houses match officials, VIP guests and many Corporate boxes. 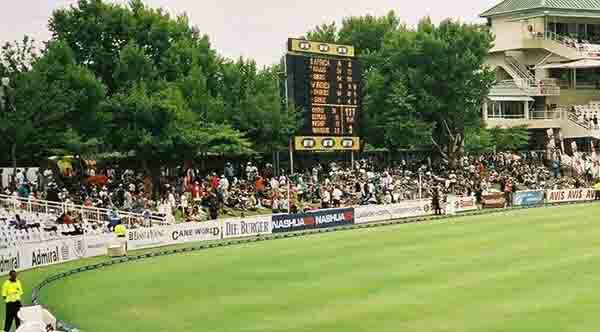 The white square to the bottom left of the picture is the sight screen on the Wynberg end of the ground. Another view of the President's stand taken at lunch time. The people in the middle of the field are the groundsmen busy preparing the wicket for the second session of the day's play. 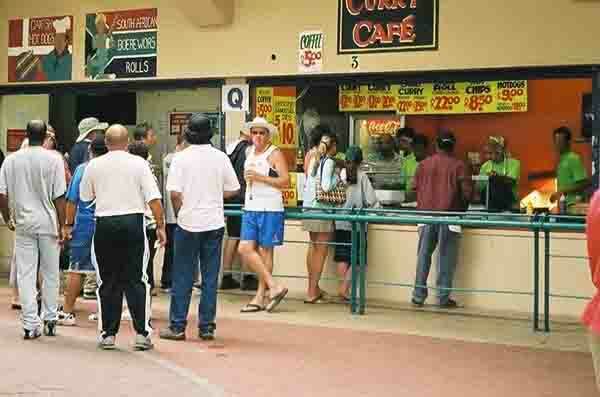 Its lunch time and the stalls under the stands are doing a roaring trade. Boy is this good or what! This is the view spectators get when sitting in the Oaks enclosure. The mountains in the background are part of the Table mountain range and the building to the right of the picture is the brewery. 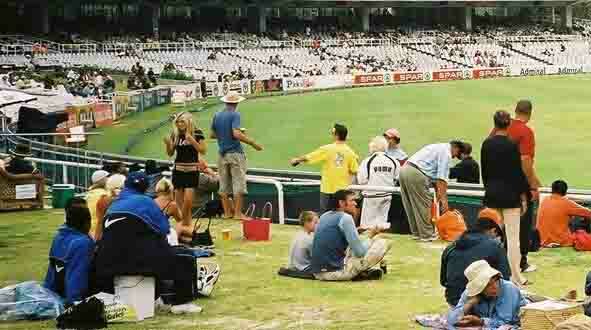 With the brewery this close, Newlands has never run out of beer. 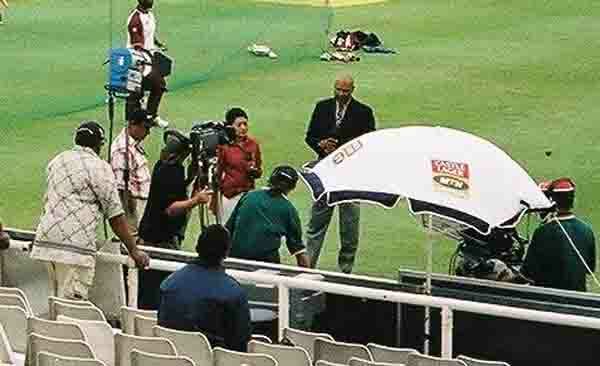 The camera on the stand is fixed there and is utilised by the TV umpires to help with decisions for run outs and stumpings if the umpire on the field is not sure if somebody is out or not. The new Castle Corner. As it was a Monday and people had to work it was not as full as it could get. The stand in the background is on the Kelvin Grove side of the ground and houses the media. Part of the Media Centre stand at the Kelvin Grove or north end of the ground. Shortly after these pictures were taken it started to rain and play was held up for about three hours. This time loss proved decisive in the end as the West Indies managed to force a draw after being behind for the whole game.